Cole Hickel (Boxleitner) is a Vietnam vet and career Marine. He has a beautiful daughter, Ellen (Case) who gets mixed up with a murdering psychopath obsessed with macabre art, naturally named Klaus (Bresnahan). When Klaus kills Ellen, Cole is enraged and wants revenge. This normally would be easy, thanks to Hickel’s military training, but the worm-like Klaus is hiding behind his “Diplomatic Immunity” privileges and he flees to Paraguay where his mother, Gerta (Foster) is some kind of big shot. After being told not to go to Paraguay by government agent Stonebridge (Forster), Hickel disobeys and goes there (and goes rogue). Once in Paraguay, he meets up with his contact, Cowboy (Drago) and loads up on weapons. Now protecting Teresa (Udenio) from the baddies, which include Klaus’ bodyguard Gephardt (Hues), Hickel must use all his wits to get justice for his daughter and make it back to the U.S. alive. Can he do it? This is the best Peter Maris movie we’ve seen to date. We were a bit hesitant going in, as we weren’t all that crazy about his past work that we’d seen, but we’re glad we did. Diplomatic Immunity is like a better version of his Ministry of Vengeance (1989). Plus, look at the amazing cast he assembled for this one! It truly is The Expendables of early-90’s revenge movies with Bruce Boxleitner. Speaking of Boxleitner, we thought it was good casting putting him in the role of Cole. It could have been some meathead, but he’s actually a good actor. We noticed Matt McColm among the stunt players, they could have used him. But they went with a more sober and believable direction. My only question is, are Bruce Boxleitner and Barry Bostwick two different people? Can anyone confirm this? Have you ever seen them in the same place at the same time? Backing up Cole Hickel - which is kind of an unnecessarily funny-sounding name - is a great cast, and we didn’t even mention Robert Miano and Ken Foree, who have small, but important parts. That’s the thing about all-star casts, talented actors don’t get enough time in the sun. For instance, Meg Foster deserved more. As did fan favorite Matthias Hues. But for a 90-minute running time, you have to concentrate on the plot and not get into diversions. Because the plot of 'Immunity is about as simple as it gets - guy wants revenge - Maris laudably keeps things on track, but such a flimsy plot just barely makes a 90-minute movie. 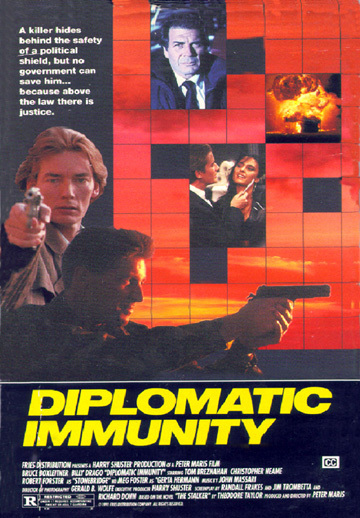 It seems this movie capitalized on the public’s interest for the concept of Diplomatic Immunity, because, for 1991, we presume people were just becoming aware of this term. This was still a relatively new thing in the minds of the public, so Maris was right there with a movie to exploit that interest. It does seem wildly unfair that Diplomatic Immunity could protect any old scumbag murderer who gets the opportunity to say “I get to go home now scot-free, I plead Diplomatic Immunity, see ya.” Apparently you can be a murderer and get to invoke this privilege. So enter Cole Hickel and his rage that Klaus took his beloved daughter. So that’s pretty much the idea. Maris should also be applauded for daring to put Billy Drago in a rare (and possibly his ONLY) good-guy role. Diplomatic Immunity is a solid, 80’s-style movie that’s worth seeing. Is it more than a one-time watch? Probably not, but it’s a worthwhile one. If you see it somewhere, pick it up. Got the VHS. In Germany called "American Steel". That is very interesting and cool. Always wonder how they choose their foreign titles. I wonder if Boxleitner will ever get another fun vigilante revenge flick to star in. We wonder that too. It's not too late. He can team up with Barry Bostwick, maybe as brothers who bust heads and no one can tell them apart. Haha.